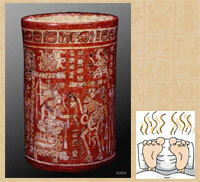 Did the Maya invent comics? ... 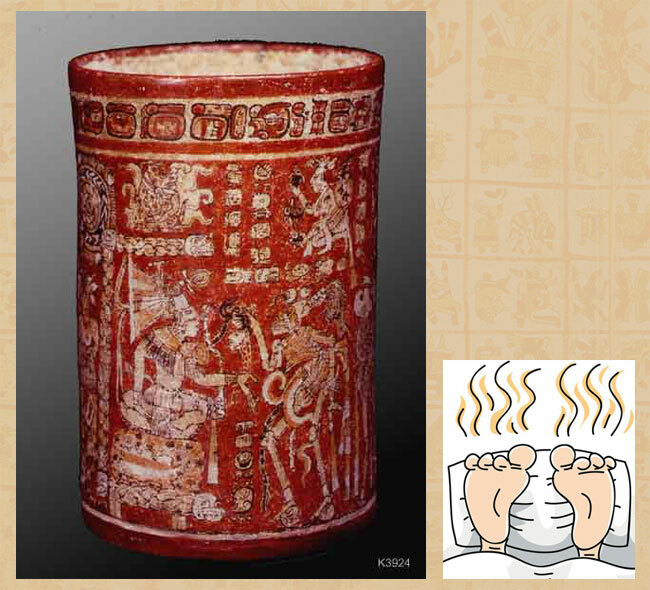 SMELL too can be (see pic 2, right) - and was - depicted visually. Among several frightening creatures in a scene that seems to be set in the Maya Underworld, Xibalba, (pic 2, left), a partly skeletonized figure on the right emits large smoke-like scrolls from his belly to signal the gasses and foul smell of decay. Eeuuggghh! Then there’s MOVEMENT. A device to illustrate motion within the same picture can be seen in a Maya vessel showing a ballgame in progress (pic 3). Whilst the wavy lines or ‘curlicues’ that float around the scene have been interpreted in the past as speech lines linking the figures to the captions in the rows and columns of glyphs, Wichmann and Nielsen point out that the scene contains 8 figures, 12 captions and 19 curlicues. An alternative function of the wavy lines would be one similar to the curlicues found in, for instance, Hergé’s Tintin, where they indicate speed or quick motion (see pic 3, bottom right, for an early example of this from Hergé). 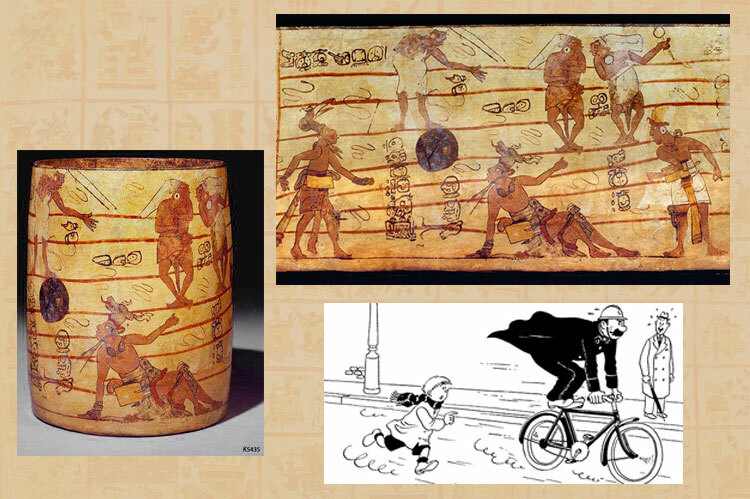 Movement can also be conjured up in the form of a narrative that unfolds physically as the viewer rotates a cylindrical vessel (pic 4), showing two successive hunting scenes involving the Hero Twins from the Popol Vuh. The first scene captures the moment when one Hero Twin has just issued a clay pellet from his blowgun. Notice that the pellet is still hanging in the air. The target, a heron-like water bird, unaware of the danger, is about to swallow a fish. Note the wings of the flying bird above the blowgun, as well as the bird below it. When the vessel is turned, the action moves forward in time about one second. As the clay bullet strikes the heron, its long neck is thrown back by the power of the shot, and it drops the fish, which is then immediately taken by the bird below the blowgun. By changing the position of the wings of the flying bird, the illusion of flapping wings is achieved. The scene, then, is presented in ultra-slow motion, so to speak. Whilst the ancient Maya didn’t use speech balloons as we know them, they certainly employed SPEECH-LINES, a functional equivalent of the ‘tail’ of the modern speech balloon. The technique, placing text in front of the characters and joining them often with speech-lines, serves to tell and show the story by combining text and image. In picture 5, an old Maya teacher instructs two young men in the arts of writing and mathematics. A fine line from the old man’s mouth leads to glyphs in front of him, saying something like ‘the line is [too] thick’ - apparently the old master is ticking off his young student for his lack of calligraphic (fine writing) skills. 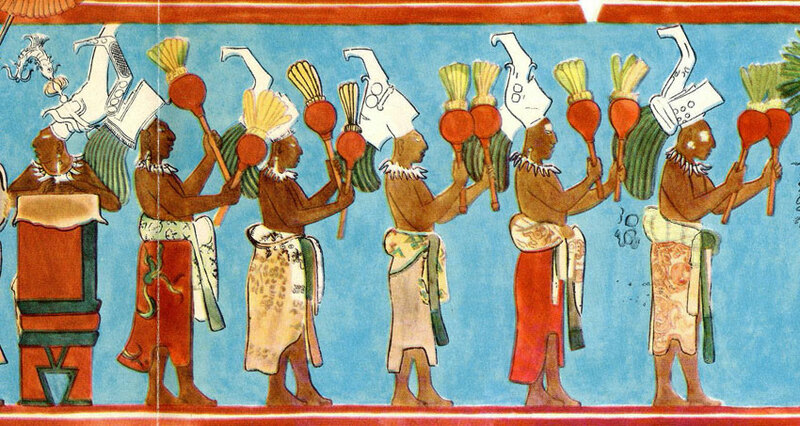 To Maya artists, the combination of text and image was the most expressive and hence preferred kind of visual communication. In our next example (pic 6), an extra element - so central to the whole basis of our comics today - is introduced: (naughty) HUMOUR. 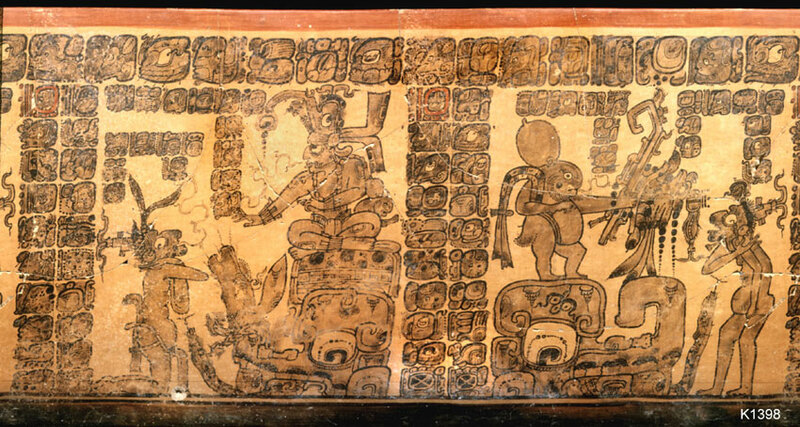 A cheeky rabbit (seen in the right-hand half of picture 6) has nicked the clothes from the naked old man on the far right (now identified as God L, one of the most important gods of the Maya underworld). Adding insult to injury, the rabbit says to the god ‘Smell your sweat, Wizard-willy’. Then (the story reads from right to left in the picture) the rabbit hides under the left arm of the Sun God, who pretends to God L that the rabbit is nowhere to be seen. Ironically, the rabbit, scholars think, then tricks the Sun God as well, by handing over the outfit of God L to the Moon Goddess. 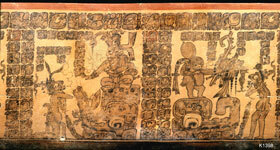 Note how Maya scribes exaggerated the size of animal characters for comic effect. 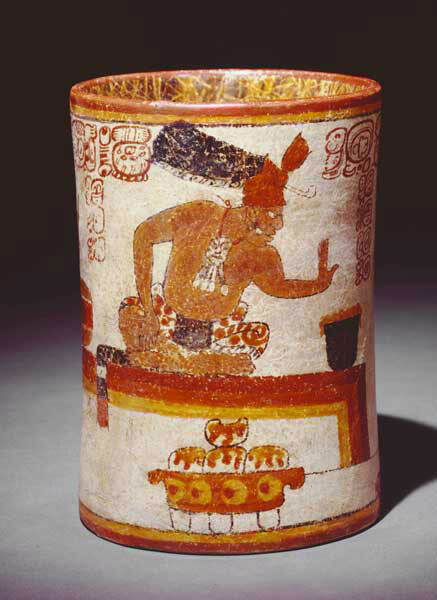 • Pic 7: image scanned from Ancient Maya Paintings of Bonampak, Mexico, Supplementary Publication no. 46, Carnegie Institution of Washington, 1955.